My wife likes her turkey sandwich cold - I like mine hot, but this is a conflict were both sides win! For a simple turkey leftover meal, nothing beats The 99 Cent Chef's Ultimate Turkey Sandwich. 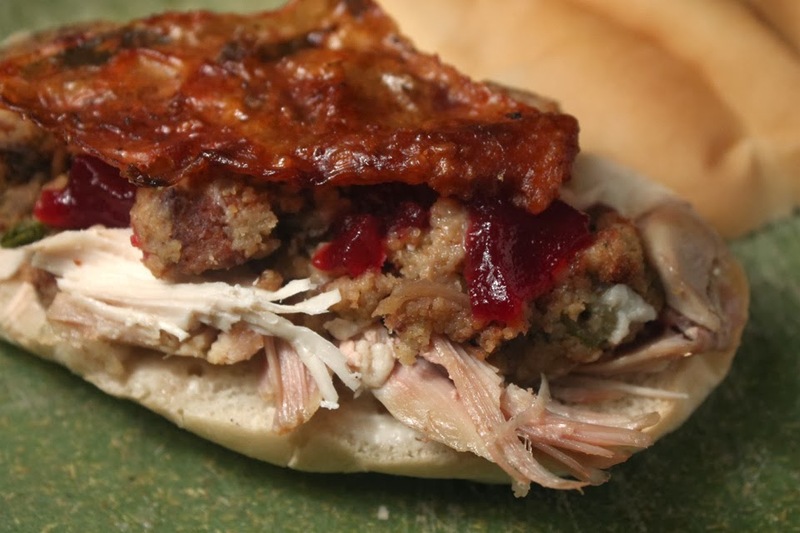 As for my Ultimate Turkey Sandwich, it's pretty simple, just the standard leftovers of turkey, dressing, gravy and cranberry sauce (click here to see my holiday recipes.) But what takes my sandwich over the top is an extra crisp layer of browned turkey skin. Usually half the table will peel off the turkey skin and leave it. If I see this then I politely ask if I can have it (or, if I am serving the slices then I ask first, before giving up any turkey skin.) I can see why the skin is set aside, it is often soggy, from sitting on the steaming bird before it's served. But I like it that way too. Inevitably there is a lot of uneaten turkey skin. The crunchy skin adds a nice contrast to the tender meat, soggy (but luscious) bread or cornbread dressing, and cool cranberry sauce. It's kind of like a Turkey BLT sandwich. 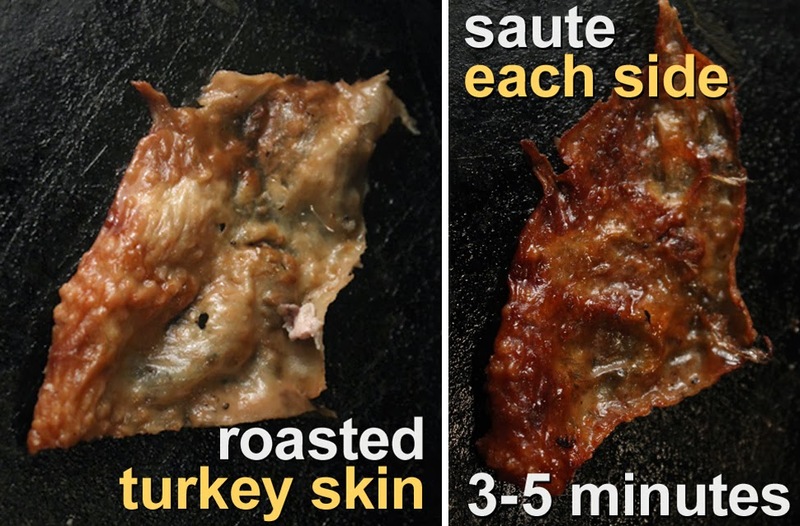 So, If you like your sandwich hot or cold, try kicking it up a notch with a crisp layer of turkey skin. And watch the video of my Ultimate Turkey Sandwich to see how I like to do it. Play it here, video runs 48 seconds. 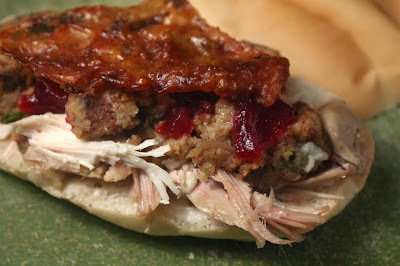 Cooked turkey, mayo (optional,) dressing, gravy, cranberry sauce, and turkey skin, between slices of bread or a roll. 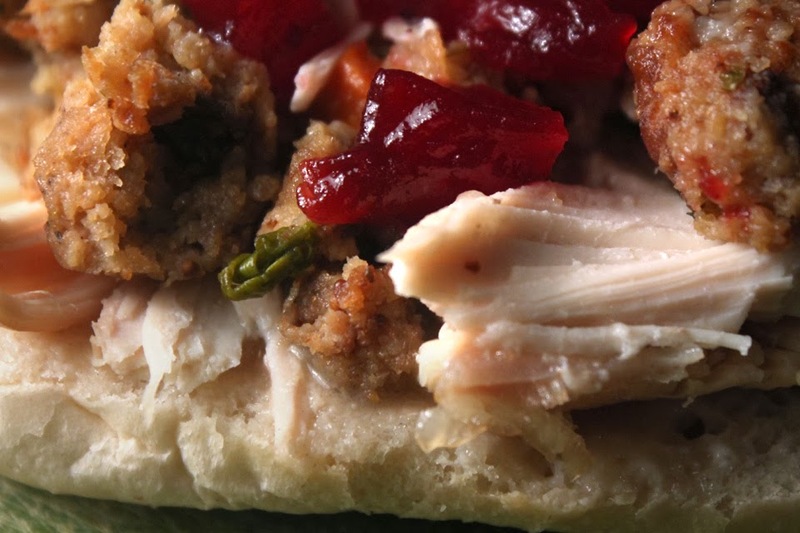 Of course, you can us any favorite leftovers and make the sandwich your way. How about just turkey, crisp skin, mayo, lettuce and tomato? Start with sauteing segments of turkey skin. 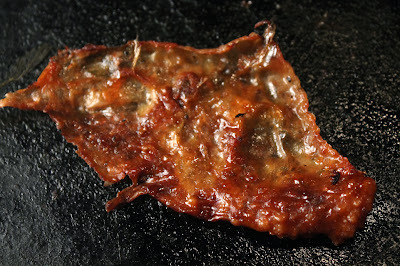 The skin can be in large or small pieces. You will add as much as you like to the sandwich. And once the skin is brown and crisp it will easily break apart to fit any size of sandwich. 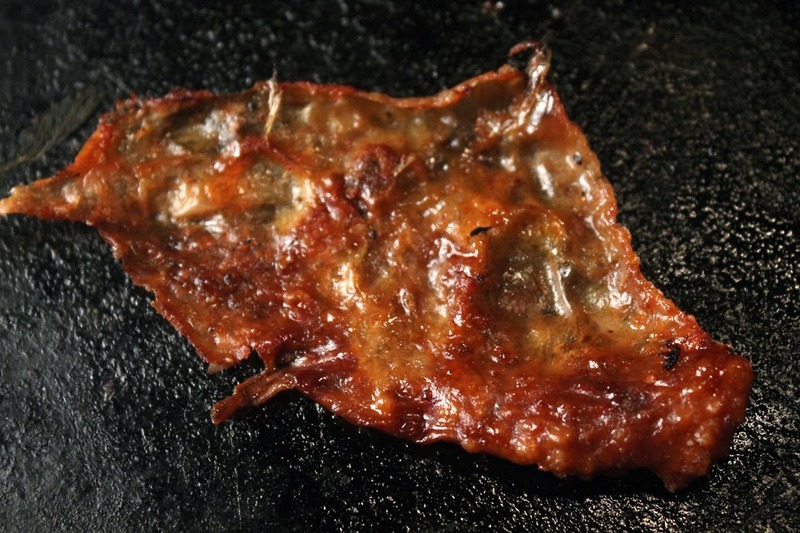 Like bacon, a lot of grease is generated crisping the skin. Saute skin until brown, about 5 minutes each side. The skin doesn't have to be totally crisp, as it will firm up more once taken off the grill, and allowed to cool for a minute. Better to undercook than burn it. When the skin is done, then microwave the turkey slices, stuffing and gravy. (Add a little water, turkey gravy, or turkey juices over turkey slices, if it has dried out.) 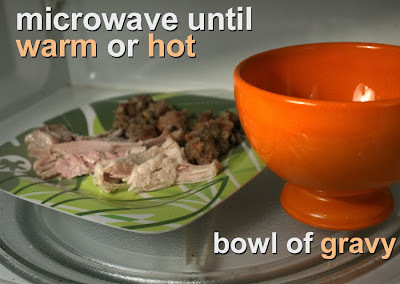 Usually I like to heat up the gravy separately to pour over the slices and stuffing as I assemble the sandwich. Top sandwich with cranberry sauce and a slice of crisp turkey skin (or a few small pieces.) Sometimes I toast the bread when I make my Ultimate Turkey Sandwich. 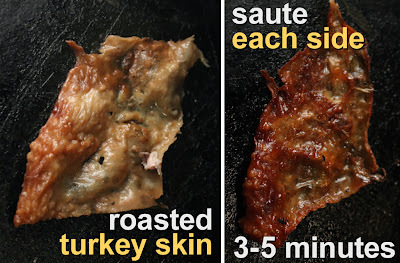 If you like a cold turkey sandwich then assemble right from the refrigerator and add the crisp turkey skin. I have a visual feast for you during this holiday -- some of my favorite GIFs, unwrapped and assembled for your pleasure. You've seen animated GIFs everywhere on the web -- usually funny, short clips of art, photos, tv and film. I started making my own almost 2 years ago. I'm sure you've noticed them peppered throughout my food blog pages, especially over the last year. GIFs look like a 2 second (or less) video clip, without sound, that keeps repeating. Sometimes I make a GIF for comedy effect, like of my nephews Chef Matt and Chef Zakk. But mainly they are best used for cooking instructions. 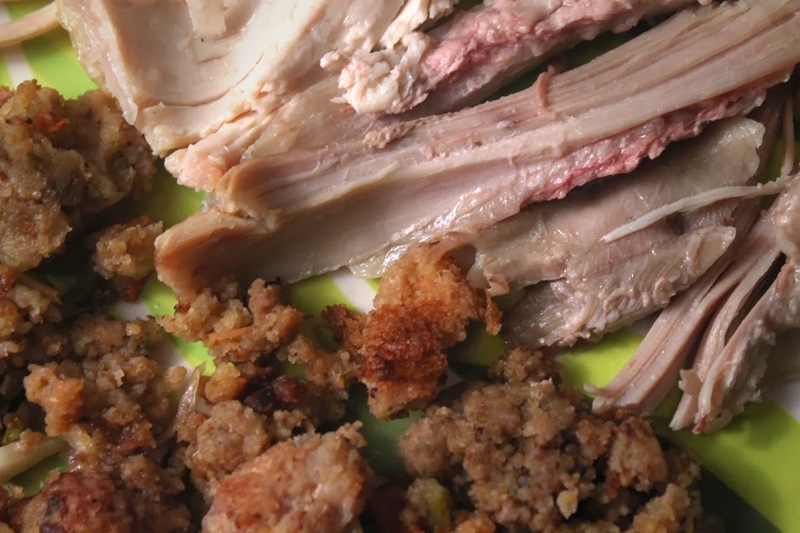 I like to show you time lapse GIFs of browning poultry, or bubbling pots of veggies and meat. That way you see the whole cooking process in a couple of seconds, which I think encourages you to make the recipe -- especially when you can see how good it looks from a raw state to completion. And instead of showing a pile of chopped herbs, it's more interesting to show them being chopped from finish to start as a GIF. Possibly the most unique use of GIFs is in my photo/video series Restaurant Nocturnes. This nighttime noir series is a string of time lapse photos with an audio track of menu highlights. These GIFs are suitable for framing. I think you will agree to the uniqueness of my animated photo GIFs. It can take anywhere from a half hour to 2 hours to create just one. A GIF is made up of separate still images, I use about 6 to 48 images to make my typical GIF. And here is where I go to create my foodblog GIFs (but there is a pop-up ad to close, when you start making one.) A detailed explanation of GIFs is here; a fun video on the art of the GIF here; and a short description is here. For a fun website to put yourself into an animated GIF, click here. So do check back for more food photography and creative GIFs in my cheap$kate food recipes. And have a delicious holiday. Here's a perfect side dish for your Christmas day feast. 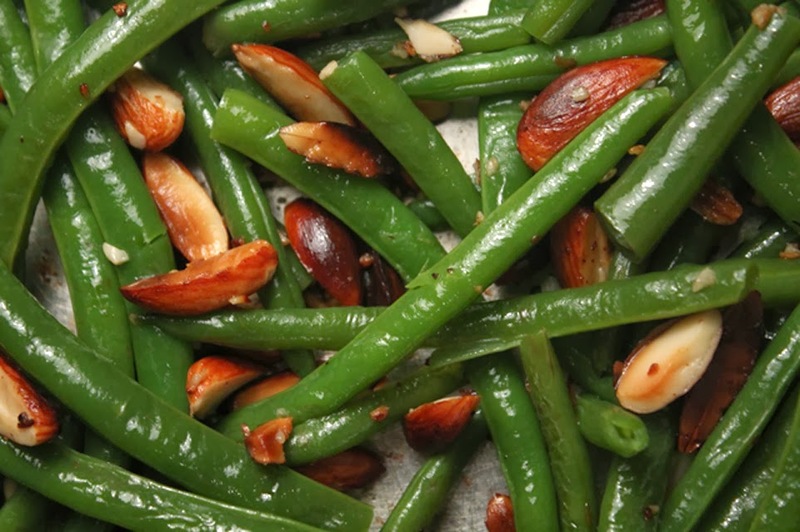 Fresh steamed green beans with crunchy almonds pair perfectly, and garlic gives it all a finishing flavor kick. 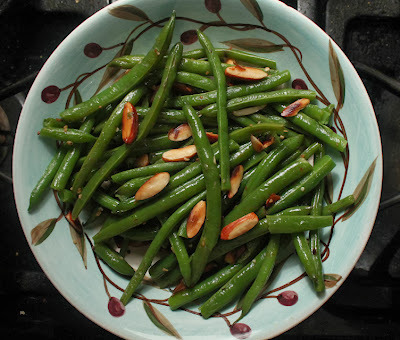 My Green Beans with Almonds travel well, so bring a casserole dish full if you are a guest. Your host will surely place it between the centerpiece roasted turkey and sweet potatoes with marshmallows. The green beans are steamed for a couple of minutes while some almonds saute with garlic in a frying pan. Finally spoon out the cooked green beans and mix it all together and serve. I used fresh green beans, but for an easy and cheap substitution it's okay to use fresh frozen green beans. Green beans are a little more expensive than dried beans, but they frequently come on sale, especially during the Thanksgiving and Christmas holidays. 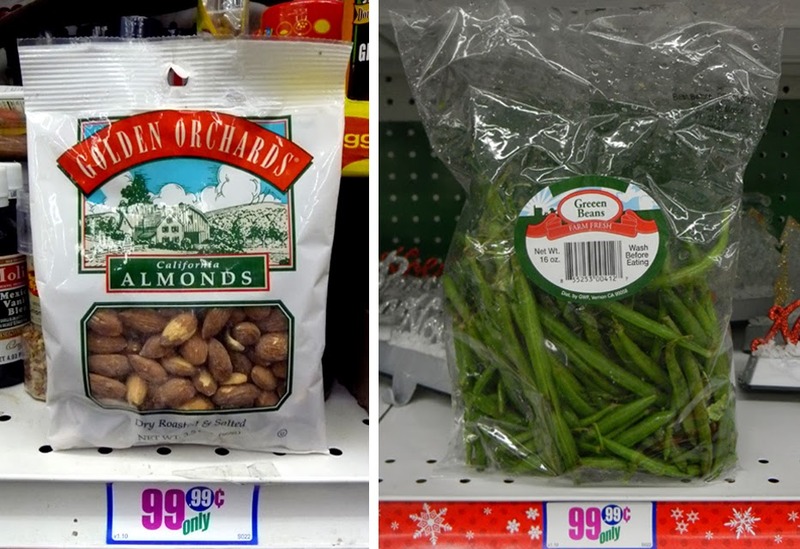 Green beans even show up at my local 99c only Stores. Nuts have been in the news lately touting their health benefits and as a diet aid to your appetite. Read about it by clicking here. You only need a 2.5 ounce package of almonds (only a handful.) I used unsalted, but it's easy enough to rinse off typical over-salted ones. Again I get my tiny package of almonds from my local 99c only Store. You can use almost any nuts on sale, including peanuts. Add my Green Beans with Almonds to your Christmas dinner menu, I'm sure the bottom of the bowl will be scrapped by hungry diners looking for seconds. 1 pound green beans - stringy stems removed. Okay to use frozen green beans. Canned green beans may be too mushy for this recipe. 1 small package of almonds - I used a 2.5 ounce package. They were unsalted and whole. I chopped each almond in half. 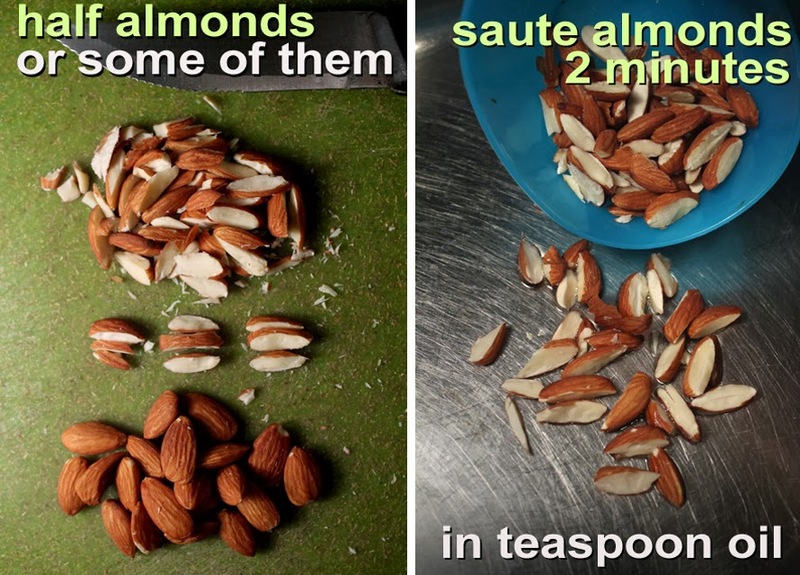 If you get salted almonds then do a quick rinse and drain. 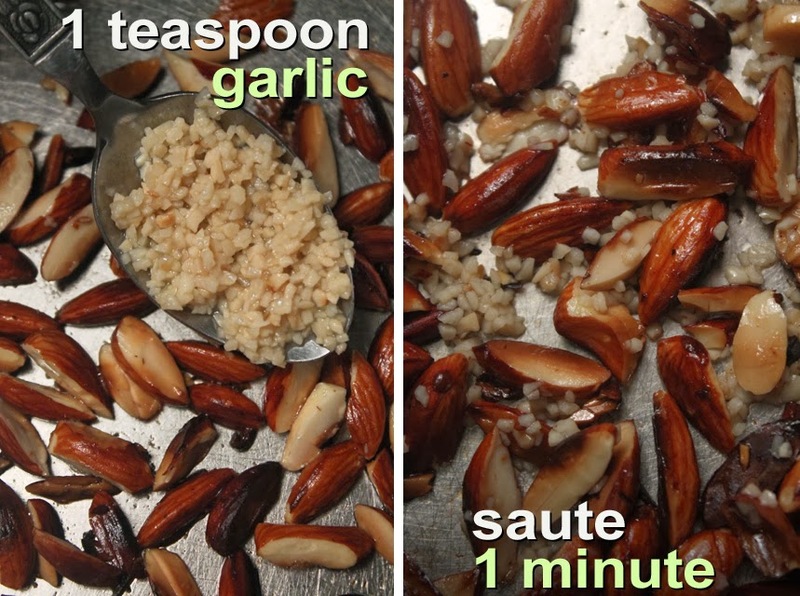 1 teaspoon garlic - I used chopped garlic from a jar. 1 teaspoon oil - I used olive oil. Salt and pepper to taste - optional. For salted almonds leave out salt in this recipe. Rinse off fresh green beans. Cut off stems and any brown, discolored parts. 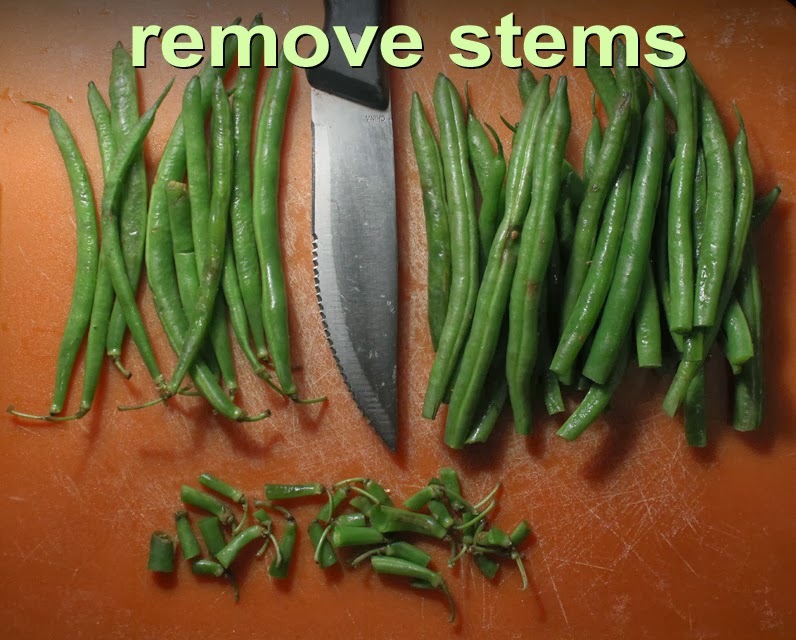 If green beans are very long, it's okay to chop them in half. 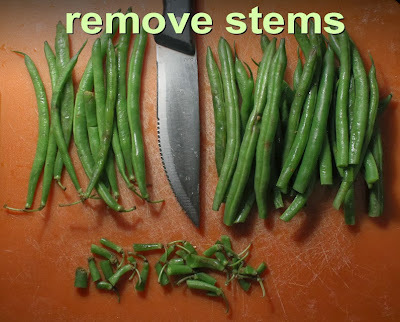 You can stem the green beans in a couple cups of water or put them on a steam rack with water. 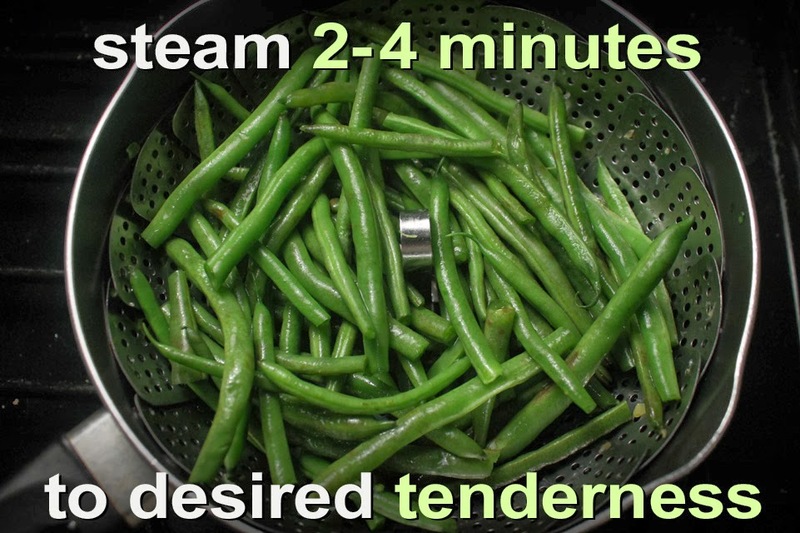 Steam covered for 2 to 4 minutes to desired tenderness. I like them a little crunchy. 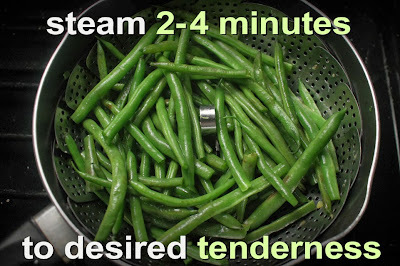 If you are using frozen green beans then follow package directions to heat them up - usually just steam in a 1/4 cup of water for about 3-5 minutes until defrosted and warm. Drain green beans when done. 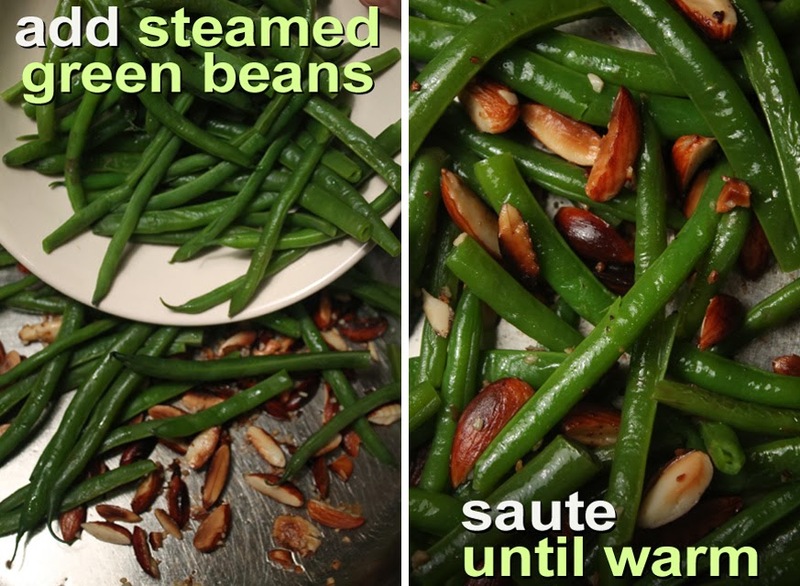 While green beans are steaming, chop each almond in half (or most of them.) You could buy slivered (pre-cut) almonds, but they are much more expensive. In a large frying pan add a teaspoon of oil over a medium/low heat. Add chopped almonds; stir and lightly toast them for about 2 minutes. You are just heating them through until just starting to brown - you will keep sauteing with garlic and steamed green beans. 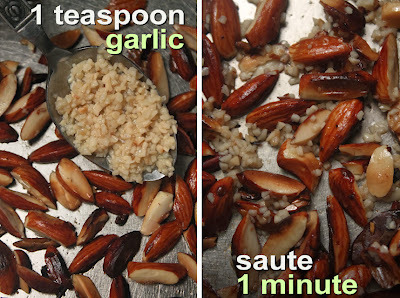 When almonds are done turn down the heat to low and add a teaspoon of garlic. Stir as you add the garlic so it doesn't splatter out of the hot pan. Saute about one minute. 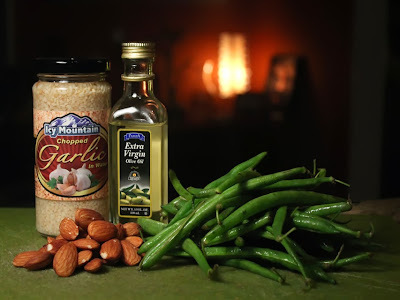 Green beans should be done by now, so add them (without the water) to the frying pan with the garlic and almonds. Mix well. Ready to serve when green beans and almonds are mixed together and warmed through. If you don't have access to almonds, almost any type of nuts will do. Just remember to rinse off salted nuts. If you use peanuts just call the dish Southern-Style Green Beans with Peanuts, or Chinese Stir-Fry Green Beans with Peanuts -- it'll taste delish with any name. 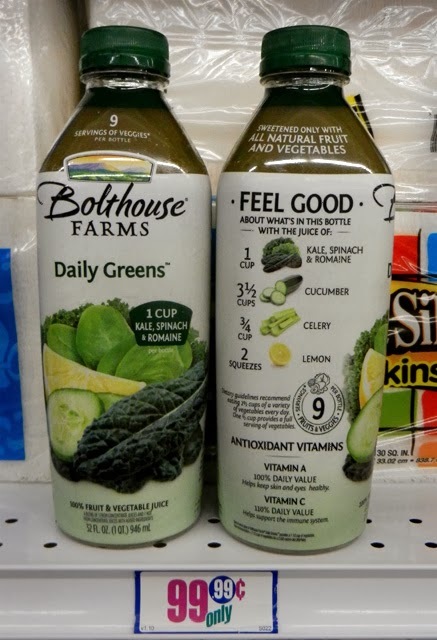 A cross between a glass of juiced vegetables and a couple shots of fruit smoothie, Bolthouse Farms Daily Greens is a delicious and nutritious combination. My Deal of the Day is the real thing and uses 32 ounces of 100% fruit and veggie juice. 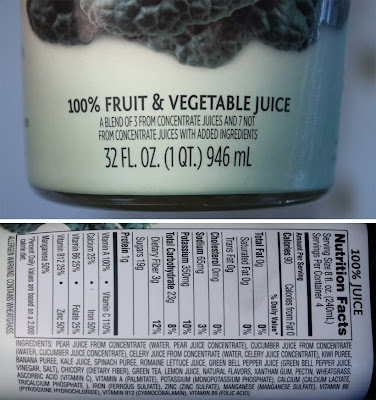 This is not a chemically addled faux health drink concoction you would expect to find in the dollar store shelves. Of course, I am no longer surprised at the great product stocked at my favorite 99c only Stores. 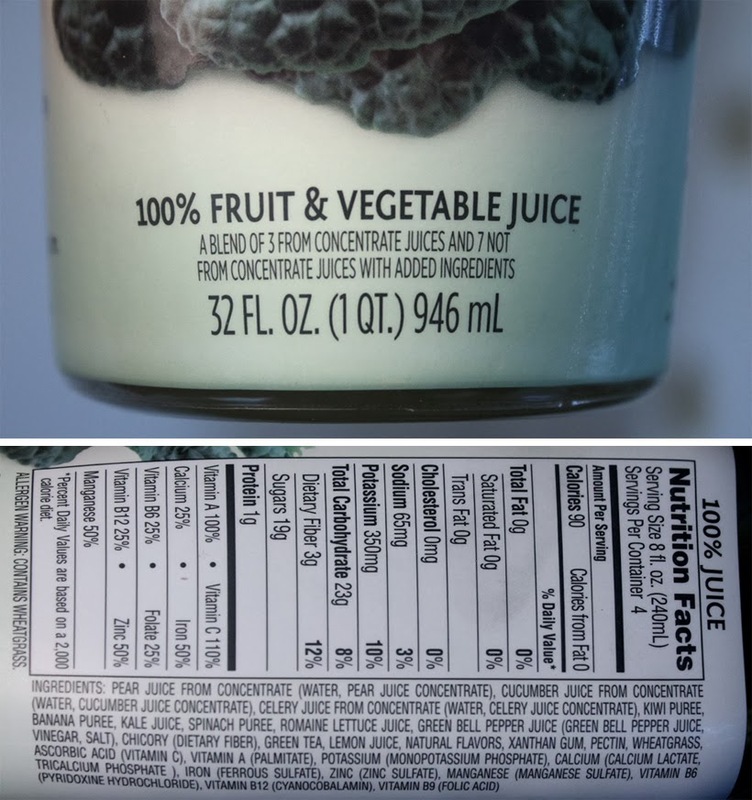 While the ingredient list is a long one, 90% of the content is recognizable fruits and veggies, including: pear, cucumber, kale, bell pepper and celery juice; kiwi, banana and spinach puree; plus green tea and lemon juice. 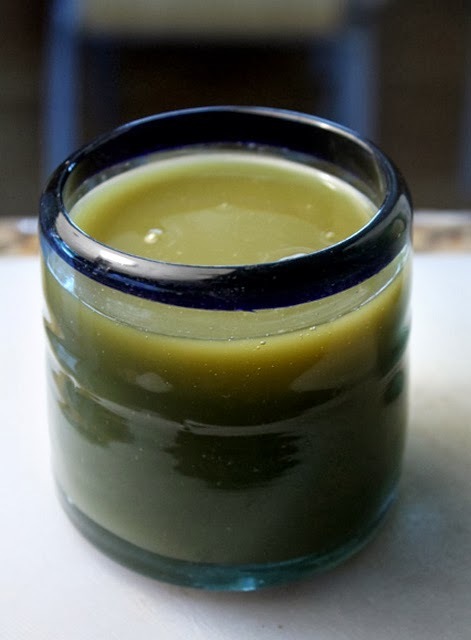 The blending of fruit and veggies makes the juice mild and slightly sweet. I found this juice in the refrigerated deli case. And it taste best chilled. Since this is a 32 ounce bottle you can easily get 2 to 3 servings. So my Deal of the Day rating of 1 to 9, 9 being best, it's a forgone conclusion: Bolthouse Farms Daily Greens drink gets a perfect 9. If you are lucky enough to find some before it's sold out, get several bottles, it's that good. Broken but not beaten. 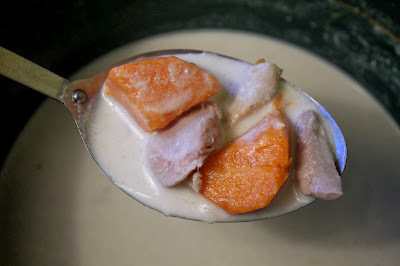 That is the underlying theme to this recipe post of Chicken & Sweet Potato Cream Soup. It's a 2-fer blogpost: how to fix a "broken" cream sauce, plus a delicious recipe! When you cook with cream, it can break apart (or curdle) into tiny cottage cheese-like flakes floating on an off white liquid. It usually happens when you boil cream or add something acidic like wine, tomatoes and lemon juice. It doesn't happen all the time. Well, here's how to minimize the problem. Just whisk in a little cream and it will disguise the problem. When cream breaks it doesn't effect the taste, just the texture. While this technique is not perfect, you'll still see some small curds, but the cream consistency is back. Now that you know how to fix cream or half and half that "breaks" while cooking, let's get to my recipe of Chicken & Sweet Potato Cream Soup. Cream as a main ingredient satisfies all appetites. 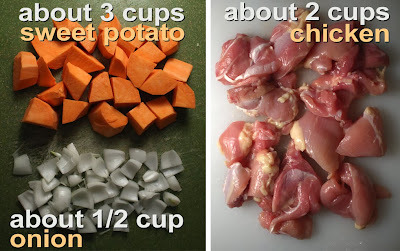 And chicken with sweet potatoes are a match made in culinary heaven. It's all slow cooked until the flavors mingle for a soul satisfying winter day hot meal. All you are doing is cooking until the sweet potato cubes are fork tender, when that happens the chicken will be done as well. This recipe can be tweaked to your satisfaction. Try adding some chunky carrots and a little musty crushed garlic. Make the meal more filling by pouring the soup over some cooked brown rice, pasta or couscous. I don't cook sweet potatoes and yams enough, so I'm always looking for recipes that use them. And during the Thanksgiving and Christmas holidays is when they are cheapest. And you know how I enjoy cooking with cut-rate poultry. 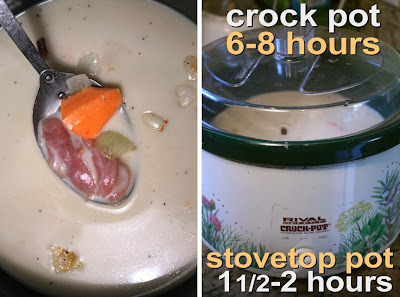 This recipe is adaptable for cooking in a crock pot or stove top pot. I provide directions below for both. 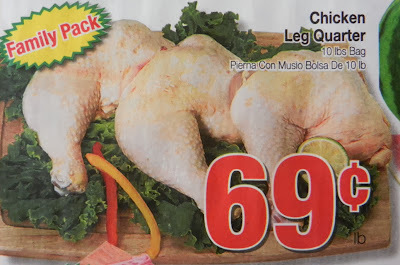 2 leg quarters or whole chicken breast - or any favorite cuts of chicken. About 1 1/2 to 2 cups chicken when cubed. You can cook with cubed chicken or whole pieces. If using whole pieces then break apart before serving - optional of course, serve the chicken any way you like. 1 to 2 whole sweet potatoes or yams - this recipe is adaptable. Make it with a lot of sweet potato or not. You can substitute with carrots, or go half and half. 1 large chopped onion - or a couple small ones. 1 cup of cream or half and half - okay to make the dish lighter and use regular milk. 1 teaspoon oil - for sauteing onion. 1 tablespoon cornstarch or flour - optional. Mixed in a 1/4 cup of water. add to thicken soup. 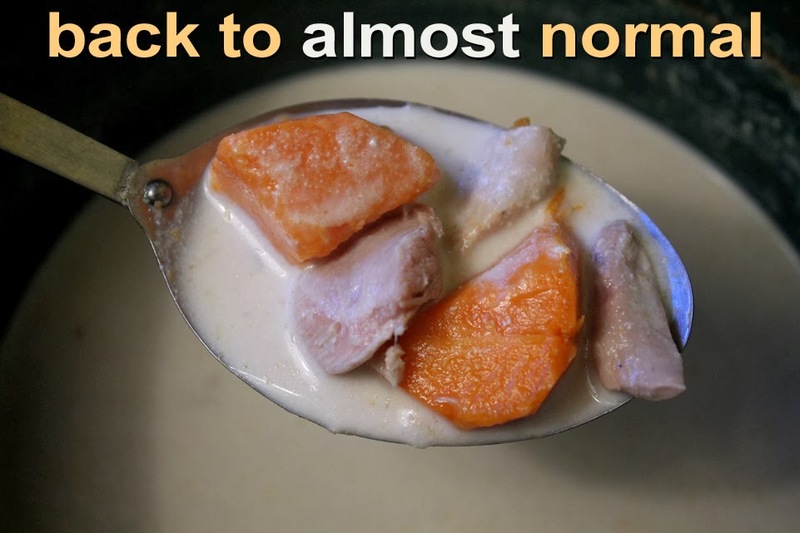 An extra half cup of cream if soup "breaks." 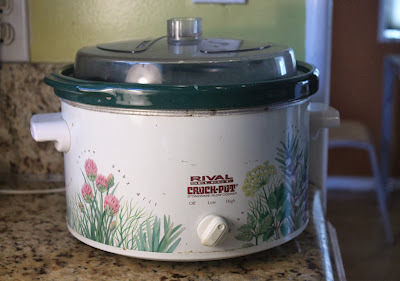 I am using a crock pot for this recipe so the cooking time is about 6 hours. If you use a stove top covered pot, then simmer about 2 hours uncovered, or until sweet potatoes are fork tender. Start by peeling and cutting sweet potatoes into 1 inch cubes - cubes don't have to be exact size. You get about 3 cups. Okay to add another cup or two. Peel and roughly chop one whole onion. 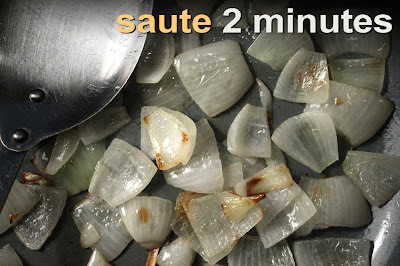 Saute onion in a pan with 1 teaspoon of oil. Cook a couple of minutes until soft. I used 4 boneless and skinless chicken thighs, chopped into 1 inch pieces. You can use any favorite cuts of chicken, whole or in pieces, with or without skin. It's up to you. And you can cook them whole and shred the meat off the bones just before serving. 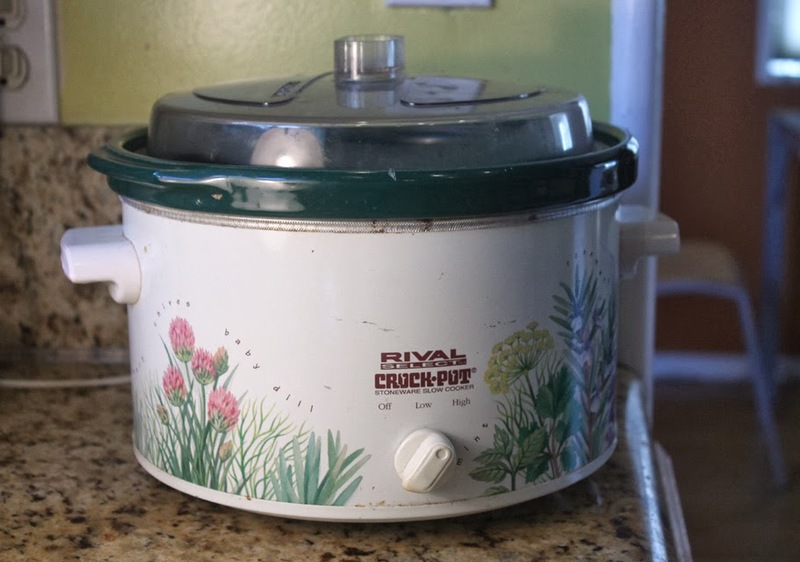 Add all the ingredients in a crock pot. Pour in 1 cup of cream or half and half (or milk.) Add 4 cups of broth (or 2 bouillon cubes with 4 cups of water.) Season with salt and pepper to taste. Stir lightly to mix cream and broth. 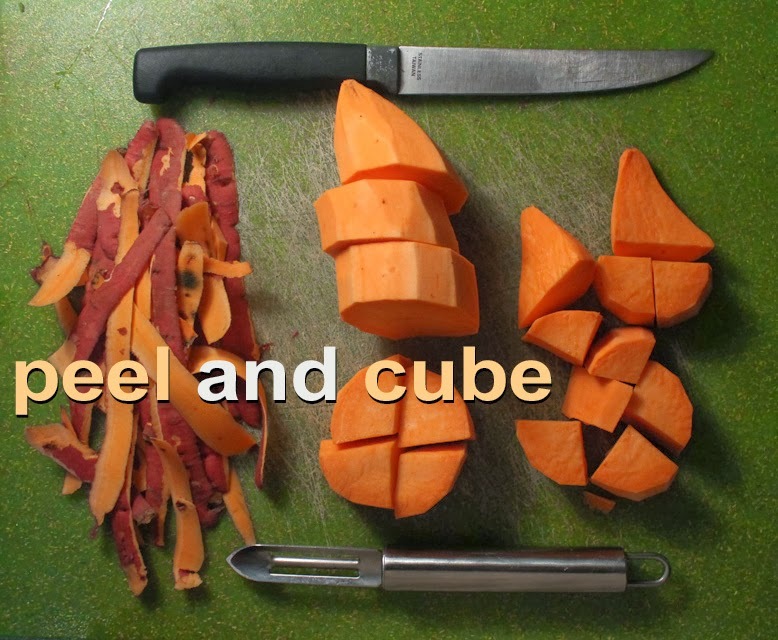 For crock pot cooking, slow cook for about 6-8 hours - until sweet potatoes are easily pierced with a fork. During the last hour you can add thickener of a tablespoon of cornstarch (or flour) mixed into a 1/4 cup of water. 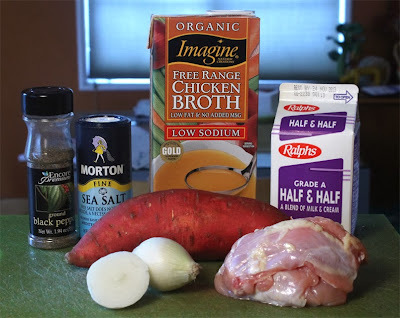 *For a stove top version add all ingredient, plus broth and cream, to a large pot. Bring soup to low simmer. Cook uncovered until sweet potatoes are fork tender - about an hour and a half, to two hours. I like to cook the soup uncovered so the liquid reduces by a third and thickens. Should too much liquid evaporate, then add more broth or cream as needed. 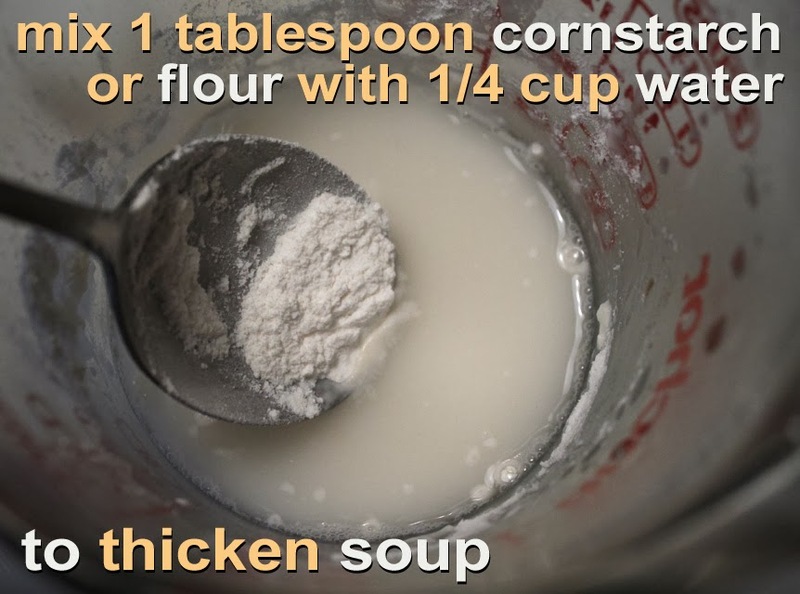 If you want to thicken even more, then can add a tablespoon of cornstarch (or flour) mixed into a 1/4 cup of water. Stir and continue heating for another 5-10 minutes until thicker. And remember if the cream "breaks" whisk in a 1/2 cup of cream during the last 10 minutes of cooking. Serve in a bowl with your favorite crusty bread. You can use any potatoes you have on hand for this recipe. I used one large sweet potato. 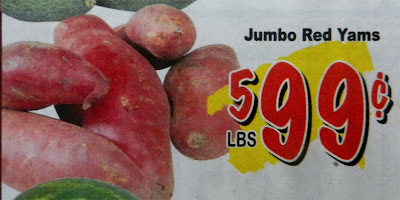 Sweet potatoes and yams sizes greatly vary. Depending on the size you will get 2 to 4 cups when cubed. Carrots are a tasty addition. I've made the recipe with half carrots and sweet potatoes. You can add as much chicken as you like, white and/or dark meat. Okay to substitute with turkey pieces (leftovers included,) like a large leg or breast. 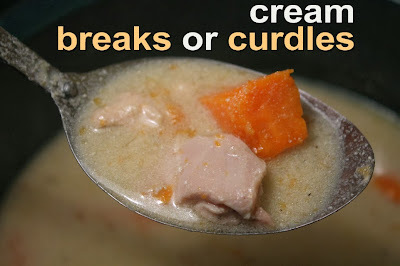 It's okay to put off adding cream until the last hour of crock pot cooking, to decrease "breaking." For stove top cooking add cream during the last 15 minutes to heat it through. For a bit more heft to your meal serve Chicken & Sweet Potato in Cream Soup over cooked rice, couscous, or most any type of pasta.